Running With The Moon is a book that follows Jonny Bealby as he carves a route through Africa to Cape Town and back. Two decades after his account was first published, we got in touch with Jonny to ask him about his experience. If you're thinking of doing an overland expedition yourself, this one's for you. What sparked the idea for this trip? Originally I was offered a job looking after a coffee plantation just outside of Nairobi, so I bought a motorbike to ship out to use there. When the place was sold I decided to ride the bike to Africa instead. After the death of my fiance 18 months earlier I was in need of a challenge; driving a motorbike across Africa seemed a great solution. Did you have a route planned before you left? Not really. I thought I would drive across the Sahara and then turn east through what was then Zaire, into Uganda and on to Kenya. But when I found many other people doing this route I decided to change plans and from the Cameroun headed south through the old French Congo, Angola and Namibia to Cape Town. Having got there in only 100 days, after a month off I decided to turn round and drive back again, this time up the east side of the continent. This is a very hard question to answer. On a journey like this, every day is filled with memorable experiences. But I guess if I should pick one it was meeting Amel, an Algerian girl in Tammenrasset, who later went on to be my wife. The marriage didn’t last but we are still friends. Besides that, reaching the Tenere desert in the Sahara, coming face to face with gorillas in the Congo, having an AK47 jammed into my ribs in Ethiopia, breaking my arm in Zambia, reaching Cairo. 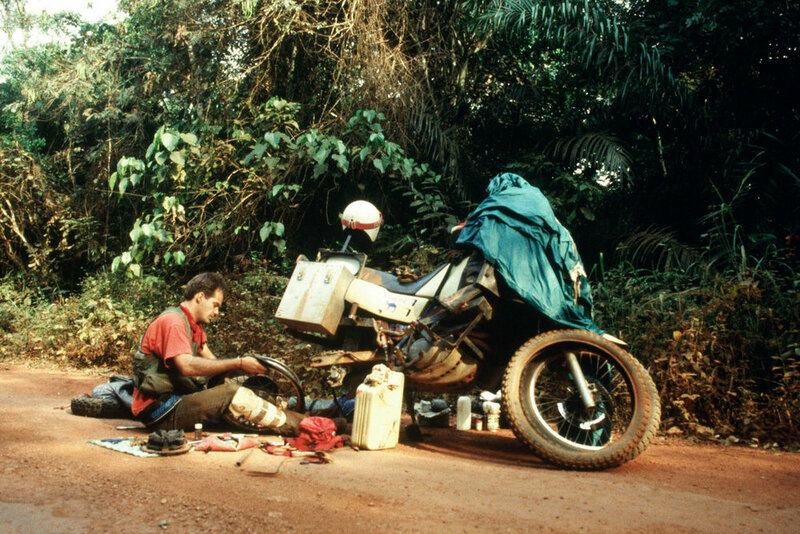 As far as riding the bike is concerned trying to get through the Congo Basin was the toughest challenge. Some days the vegetation was so dense I didn’t see the sky. There were swamps, huge spiders that fell on me from above, leaches that stuck to my legs and in one place two gorillas came crashing across the path up ahead. One day I rode from dawn to dusk and only managed twelve kilometres. Without sunlight, alone in the depths of that dense jungle - it was a depressing place that I was happy to be out of. How did writing fit into your time on the road? Did you keep a journal? I just kept notes. Very early on I realised I wasn't going to have the time to write a full long-hand diary and so if I did want to write a book, it would be better that I kept notes - so that’s what I did. I have always found the tiniest note can trigger very precise memories and that is enough when writing things up later. Of course, this was all in the days before the internet and so I didn’t have the pressure of blogging live while on the road; which I think is a real curse for the modern adventure traveller. Nowadays you feel compelled to tell your story when you should be out there living it. When did you decide to turn your account into a book? After I met Amel in the middle of the Sahara I realised that I was doing something quite special and that the fates seemed to be adding to that story. I was still very unsure if I was capable of writing a book but I knew then that this might be a possibility. I kept better notes from the Sahara onwards! Have you been back to any of the places that you travelled through? If so, what's the biggest change that you've noticed? As I write this I am in Addis Ababa. The first time I was here was towards the end of my journey in 1991. The communist regime of General Mengistu had just been overthrown and various factions were vying for power. The place was in such chaos my hotel room in Addis came under fire, leaving me little choice but to seek sanctuary behind the iron sides of the bathtub - a trick I had learnt from reading some spy novel! Anyway, the place has changed hugely and is now a building site. A fun, lively and dynamic building site but, a building site nonetheless. As the economy grows (with double-digit growth according to the government), it’s easy to understand why. But out in the countryside, I doubt things have changed that much. Ethiopia was one of the great surprises of my journey. When I left the UK I had not thought I would drive through the country and therefore, knew next to nothing about it, other than what I remembered from the famine of the mid-80s. What I found was an amazing place of great natural beauty with a very warm and welcoming population. That is still the same today, and as such is a key location for my travel company, Wild Frontiers. For those of us that want to turn the pipe-dream of an overland trip around the African Continent into reality; what advice do you have? What's the first step? Just do it. Buy a bike, get a carnet and get on with it. I am not sure of the best route today, probably around the West of Africa, but its still possible and Africa still represents the best continent in the world for a motorcycle adventure. Someone said to me recently that my trip was done in the golden age of motorcycle adventure; I don’t know about that, maybe, but it is still possible and I advise anyone looking for an adventure to do it. It is something that will stay with you forever. How did you prepare before you set off? I bought a bike – a Yamaha Tenere XT600, which was perfect – then took it to my father’s farm and modified it for the journey… adding panniers and jerry can racks. I looked up which countries needed carnets, got which visas I could in advance and left. Simple as that really. I have never been one for over planning. I think the best fun and most meaningful times come with spontaneity. People can plan the life out of travel. If you have time (and a motorbike) better to just follow your nose. Did you find yourself in a position in which your bike was broken down but you weren't able to fix it? Only once, in Addis funnily enough. But with the help of a local mechanic, we eventually realised it was just that all the rubbish fuel I had been putting in it for the journey had blocked the exhaust. Once we cut that in half and bashed out the baffles it was fine. The XT is a great overland bike, pretty much perfect for the journey. Those on big BMWs were really struggling, particularly in the desert where they just found them far too heavy. What was the one thing you wish you'd brought with you & the one thing you found that you could do without? I could do without practically everything. I left the UK loaded down with everything I could take, from camp bed to collapsible kitchen sink… no kidding. In the end, I just gave them all away realising a) I really didn’t need them and b) on tough terrain it was much easier to ride a light bike than a heavy one. One thing that was a great success was a collapsible fishing chair. I carried that all the way and it was great to sit in after a long day on the bike. Could you tell us about Wild Frontiers and the work that you're now doing with that? After Running with the Moon, the book I wrote about this African adventure, I went on to write two more books, one about India, Pakistan and Afghanistan and another about riding a horse along the Silk Road. But after that, I realised I had done enough writing and what I really enjoyed was showing people the places I’d discovered and introducing them to the people I’d met along the way. Forming a travel company to do that was the obvious thing. Now, 15 years on, we take around 3,000 people a year to nearly 80 destinations. It is great that the passion I developed through my bike ride around Africa has led to a successful business and a great career path for me. I consider myself very lucky for that.